If you own, work in or manage a business that utilizes industrial heavy duty steel racks and warehouse shelving, you are certainly aware of the importance of choosing the most efficient storage solutions and selecting storage systems from the wide array of choices available in today's marketplace. Without a doubt, the most common type of heavy duty steel storage systems available today come in the form of component-based rack and metal shelving systems. Many types of heavy duty industrial storage systems incorporate layout and design elements that are geared toward increasing a warehouse's storage density. Layout and design complexity over the past decades have incorporated many innovations in metal shelving unit and rack styles. Most roll form and structural rack installations now incorporate rack supported wire mesh decking. Wire decks are a highly desirable shelving unit accessory incorporated into warehouse layout and designs and add to both the warehouses safety and functionality. Accessories like wire mesh backs, wire decking, closed tube posts, column protectors and guard rails and safety netting all increase a rack's safety and minimize the maintenance and damage done to any storage systems. While simple storage cabinets work for storing small items, other specialty storage systems in common use today include bulk racks, drive in racking, rivet shelving, wire shelving, double slotted racks, carton flow & bulk storage racks, coil, cantilever & lumber racks and rack supported structures, to name a few. After reading these rack warehouse storage guides, you'll be able to make better informed decisions on the various benefits and advantages of several of today's most common warehouse storage solutions. Below is a sampling of different industrial rack & shelving unit brands that we carry here at SJF Material Handling in stock. We specialize in tear drop style racks and stock Interlake Mecalux, Wireway Husky, Steel King, Ridg-u-Rak and other major brands in refurbished and used racks. Don't worry if you are looking for a certain brand and it isn't listed below... we carry all the major brands at SJF Material Handling. If for some reason we don't have it in stock at the moment, our sales professionals are experts at finding the hard-to-find brands you need. While these guides are meant to assist you in choosing racking systems for your warehouse, it is still beneficial to consult with one of our professional solutions specialists. They have been working with industrial racking every day for years and are aware of all the tips and tricks concerning rack systems for the warehouse. Please feel free to call us at (320) 485-4974 (direct sales line) or (800) 598-5532 to discuss your planned layout. Pallet rack system components for pallet storage include: upright frames, pallet shelving beams, pallet rack shelves, wire decking, rack-back safety panels, column protectors and shelf supports. Teardrop pallet racks are a type of selective roll formed pallet rack shelving systems and are the most common types of warehouse racking systems used for pallet storage. All storage rack and shelving is made from either structural steel or roll form component parts. They can be sold as pallet rack starter and pallet rack add on kits with everything included or are priced and purchased separately as component upright frames, beams & rack supported wire decks. These storage classifications include: drive in rack systems, drive through rack systems and pushback rack systems. Traditional storage racks and steel shelving allows for many rows of storage and is a great solution for many warehouses. 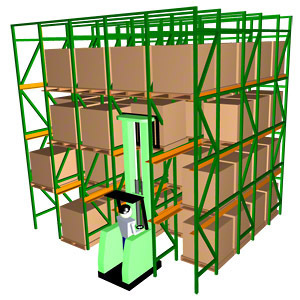 For warehouses that have a large amount of inventory that shifts on a regular basis, drive in racks, drive through racks or push back rack systems are a popular solution you may want to consider. These systems include: pick modules, carton and case flow, span-track and pallet flow systems. Put simply, the main advantage of flow racks is that merchandise remains better organized and easier to find/pick. 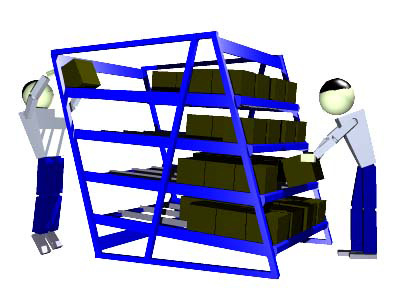 With carton flow rack, the product is automatically rotated on a first in/first out (FIFO) basis. The concept is simple and effective. These storage systems include: lumber racks, auto salvage racks, cantilever supported roofs, pipe racks, steel racks, PVC storage shelving, industrial steel shelving systems, furniture racks, warehouse steel shelving, roll out rack storage systems and more. 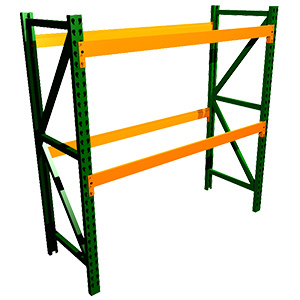 Cantilever rack and lumber racks are a very popular industrial warehouse shelving. Lighter versions of this type of industrial warehouse shelving are also known and sold as furniture racks or pipe and sheet steel storage shelving. All of these warehouse storage shelving systems provide an ideal shelving solution for storage of long, bulky materials such as lumber, PVC, sheet metal, bar stock or pipe storage. 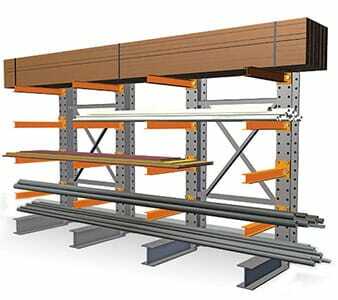 Furniture rack is a style of lighter duty capacity cantilever racking that can be decked to provide static storage similar to pallet racking.